Pay Yourself First with a Money Market Account! Have peace of mind thanks to a community bank that is focused on your financial well-being. *Click for details. 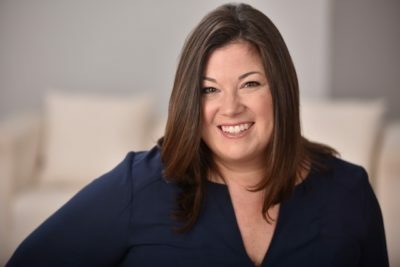 Please join us in officially welcoming Jill Ross, our new Senior Vice President and Chief Retail Officer to our William Penn Bank team! At William Penn Bank, we are all about building relationships. That’s why we want you to get the most out of our 1 Year CD. 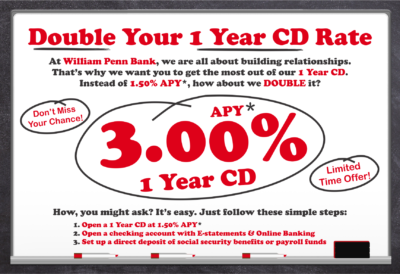 Instead of 1.50% APY*, how about we DOUBLE it? *Click for details. How’s Your CD Attention Span? Don't BARK on These Deals! *Click for details. If you’ve ever participated in career day at a local elementary school, you’ll probably relate to this story. Check out a letter from our President Ken Stephon about our new website! Our second annual Christmas Tree Lighting Ceremony is in the books!